The Rocking Monk to co-host the Martin Judd stage on our first Friday! As mentioned yesterday we promised 2 Steve’s hosting our first Friday night…Today we bring you local radio presenter and good friend of the Festival Steve ‘the rocking’ Monk, who will be joining Steve Kellam as compere. Those of you who follow the local Rock music scene, may of heard Steve on his radio show Rock Hard on a Tuesday evening on Radio Ashford. 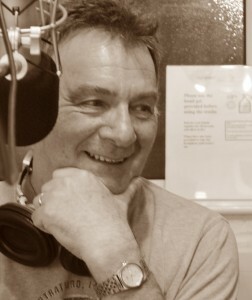 He also presents the Home Time show every weekday, and is well known in Ashford for his knowledge of Rock music and opens our ears to unsigned local bands and rock music from far and wide alongside his show co-host Phill Thorne. I caught up with Steve and asked him about the Festival and what he was looking forward to.. This is the Festival’s 11th year….Steve how important are events like this one important to Ashford? Very, The Ashford area has a huge number of first class acts and artists from all walks of life, genre and age ranges. Unfortunately we don’t have enough live venue choices, it costs money to go and see artists so a festival is a great platform to see local acts from across the entertainment spectrum. You are no stranger to helping comparing and organising a Festival, tell us a bit more about your involvement this year? This year’s Festival in the Park is the first one that has a Friday night Rock & Blues event. I have attended the festival in past years as an onlooker and as a band member and have always thought it to be a nice easy laid back friendly festival. I was honoured when I was asked to co-compere this year’s Friday night on the new “Martin Judd” stage. I like many others; have the greatest admiration for Martin, he was a great and lovely person. The Festival’s ethos is to nurture and promote local performing arts and sport in varying form, how do you feel about exposing families and young people to live music? There is a kind of magic about live music, every band, artist and act you see on your television has had to start somewhere, many have been influenced by their idols and bands they have seen. We need to keep the wheels turning; we need to give the youngsters the chance to play and the chance to watch and experience live music and arts. The Beatles had to start somewhere and someone had to see them live. You have 2 shows on the community radio, Radio Ashford, have you had any Festival performers in as guests on either of your shows so far? Yes, Bloodstone Blue, James McDonald a local stalwart and underrated solo artist, a young lady called Natalie Shay and Danny Leigh have appeared on Hometime, Danny Leigh, Marylebone Jelly and Legacy are scheduled to come in too. I regularly play a couple of local unsigned acts on Hometime. On Rock Hard we have always encouraged bands in on the show, The Rash and Legacy have been in and Slam Cartel are a favourite too.